President Barack Obama is claiming that murder rates are declining in Dallas, Los Angeles and nationwide, even though numerous sources of data shows a nationwide spike in murder since he launched his 2014 stigmatize-and-federalize campaign for the nation’s state and local police forces. “Over the last four or five years during the course of my presidency, violent crime in the United States is the lowest it’s been since probably the 1960’s … in places like New York or Los Angeles or Dallas, you have seen huge drops in the murder rates,” Obama claimed at a July 9 press conference held in Warsaw, Poland. In fact, murder rates are climbing in Dallas and Los Angeles, and in many other cities. The murder rate has spiked in Dallas by almost 90 percent during the first five months of 2016, putting the city on track to exceed local murder rates at the end of President George Bush’s tenure. The Dallas increase adds up to roughly 100 additional dead Americans in 2016 — including many African-Americans — compared to 2014, the year Obama began his campaign-trail demand for changed police practices and policies. Only in one of the three cities mentioned by Obama — New York — has the crime rate continued to drop during Obama’s tenure. Outside New York, the murder rate is also way up in Baltimore, Chicago, and many other Democratic-dominated cities with large African-American populations. Obama is trying to hide the murderous cost of his policing policy by claiming the average murder rate since 2011 is below prior murder rates. His clever phrase, “over the last four or five years …since probably the 1960’s” — buries the dramatic murder spike that has happened since Obama began to criticize state and local police forces after August 2014. The murder spike began after he began his high-profile criticism of police forces just after the African-American urban riots in Ferguson, Mo., and just before the poor African-American turnout allowed the GOP to defeat five Democratic Senators and take control of the U.S. Senate. After the election, Obama blamed his supporters — including African-Americans — for the low-turnout defeat. “I’m obviously frustrated with the results of the midterm election. I think we had a great record for members of Congress to run on, and I don’t think we — myself and the Democratic Party — made as good of a case as we should have … [so] we had really low voter turnout and the results were bad,” he told National Public Radio in December 2014. More than a decade ago, in 2004, 248 people were murdered in Dallas. For multiple reasons, the murder rate dropped step-by-step down to 113 dead in 2013. But the murder rate then jumped almost 17 percent in 2015, bring the death toll up to 136 dead for 2015. It has also jumped by almost 90 percent during the first five months of 2016, putting the city on track for a 100 percent jump in murders from 2014 to 2016, even as Obama described it as a model city for using the new police techniques he’s pushing on the rest of the country. Statistics presented by [Police chief David] Brown on Monday showed there were 25 homicides from Jan. 1 through the end of February, up from 19 in the same period in 2015. But in the days since that report was completed, there have been nearly 20 more slayings in the city, including two men who were fatally shot early Monday in Lake Highlands during a drug deal that went awry. Brown said that the murder rate has now jumped a whopping 86 percent over last year. And other violent crimes have been increasing. There have been 782 robberies of individuals compared with 701 this time last year and 945 aggravated assaults this year compared with 692 last year. Obama is praising the Dallas police department for adopting his preferred police tactics. Some “police departments … are doing the right thing, like Dallas, which has implemented the very reforms that Black Lives Matter has been seeking … [and] because of its transparency and training and openness and engagement in the community — has drastically brought down the number of police shootings and complaints about misconduct,” he said at a Sunday press conference. In the wake of the shooting of Michael Brown in Ferguson, Mo., the department launched a new tool detailing officer-involved shootings in the department. In a distinct break with the way such incidents are handled in other jurisdictions, the Dallas department identifies not only the number of such incidents but also their locations, the outcome of the incident — and even the names of the officers. Earlier this year, the data provided was made more robust, including other incidents in which force was used. “We try our best to be transparent,” Dallas Police Chief David Brown wrote for the Dallas Morning News after Ferguson, “and I can tell you that not all cops like it. It does open us up to criticism, threats and exposure of every mistake we make. But it’s the right thing to do.” The focus of that essay was an officer-involved shooting in the city in 2012, an incident that threatened to similarly spill over into violence but didn’t, thanks to the department’s focus on transparency. In Los Angeles, the 2016 murder rate rose by 27 percent, despite Obama’s insistence on Saturday that there was a “huge” drop in the city’s murder rates. The city’s murder rate also rose 10 percent in 2015. In 2015, the city also saw a sharp jump in other crimes, such as violent assaults. Prior to 2014, Los Angeles’ murder rate had fallen steadily since 1993, down to 296 dead in 2013. Obama can’t have missed the many reports by non-profit groups showing the crime spike since 2014. Murder rates in the nation’s biggest cities climbed by 11 percent in 2015, the left-wing Brennan Center for Justice admitted in November 2015. The center’s report, titled “Crime in 2015: A Preliminary Analysis,” projected the 2015 murder toll in 25 cities at 3,668 dead. The left-wing Fivethirtyeight.com website reported in September 2015 that the higher crime rate had buried an extra 482 murder victims. The left-wing Marshall Project admitted at 14.5 percent increase in 2015, and also indirectly suggested that Obama’s blame-cops-first policy may contribute to the greater violence. It is unclear what is driving the problem, but … Multiple studies have demonstrated that, controlling for other factors, when communities view the police and criminal justice system as illegitimate, they become more violent. When people believe the system is unwilling or unable to help them, they are more likely to take the law into their own hands, creating the cycles of violent retribution. That claim is backed by by some data, For example, a Gallup poll in June 2015 showed confidence in the police had dropped to a 22-year low. On many occasions since 2014, Obama has hinted or said the law enforcement is distorted by racism. 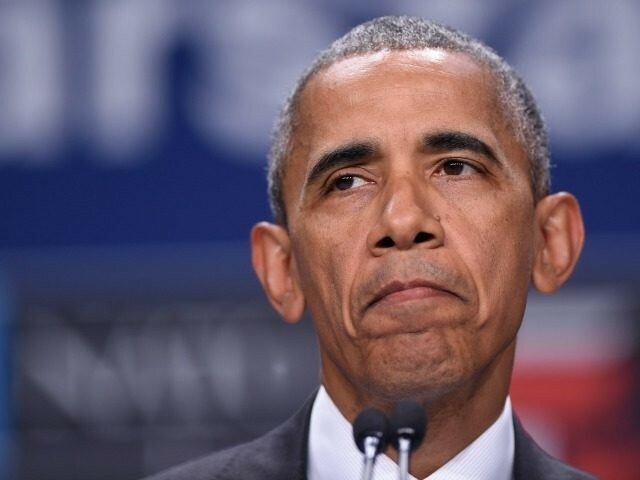 “We can’t just lock up a low-level dealer without asking why this boy, barely out of childhood, felt he had no other options,” Obama said in an address to Howard University graduating class in May 2016. “We have cousins and uncles and brothers and sisters who we remember were just as smart and just as talented as we were, but somehow got ground down by structures that are unfair and unjust … yes, you’ve worked hard, but you’ve also been lucky,” he said. Obama is trying to change national policing rules by suing state and local agencies, and by offering to increase and cut grants to local police forces. So far, at least 30 state and local police forces have accepted Obama’s new police rules. Just before the Dallas attacks, Obama used two shootings in Minnesota and Louisiana to call for federal direction of state and local police forces. There are some jurisdictions out there that have adopted these recommendations. But there are a whole bunch that have not. And if anything good comes out of these tragedies, my hope is, is that communities around the country take a look and say, how can we implement these recommendations, and that the overwhelming majority of police officers … that they encourage their leadership and organizations that represent them to get behind these recommendations. Hillary Clinton is also pushing Obama’s blame-racist-cops-first message, partly to boost her tepid support among African-Americans. “I’m going to be talking to white people, we’re the ones who have to start listening to the legitimate cries coming from our African-American fellow citizens,” she said in a July 8 CNN interview. In fact, Obama and his deputies have aggressively rejected any criticism from police officials, including FBI director James Comey, who argue that increased political scrutiny of cops is reducing law enforcement and increasing death rates. Comey described that political and media oversight as a “chill wind.” To hide the spike, Obama has repeatedly compared 2015 crimes rates to pre-2013 rates, allowing him to say crime has dropped to near-record lows while ignoring the 2015 and 2016 spikes. … 53 percent of respondents say they now “worry a great deal” about rising rates of crime and violence. That is a rapid rise — in 2014, just 39 percent were worried a” great deal” as they are today. Concern among swing-voting independents rose from 36 percent to 53 percent. Among Republicans, the “great deal” number rose 15 points up to 53 percent, bringing it level with the 52 percent concern among Democrats. Seventy percent of people with just high-school degrees — but only 32 percent of people with college degrees — said they were worried a great deal about crime. Those two numbers have risen by 20 points and 1 point, respectively, since 2014. Between 1960 and 1980, crime rose fourfold in the United States, while judges and cops reduced enforcement because of heavy social and political pressure — 60s-era delusions, left-wing demonstrations, media pressure and the complete failure of older Americans leaders to defend the nation’s generous and very successful culture. The nation’s murder rate roughly doubled from 1964 to 1973 and didn’t start declining until the 1990s, leaving tens of thousands of Americans dead. Amid the rising crime, civic culture shifted — people socialized less and watched more movies about violent crime. Mainstream movies applauded tough cops and vigilantes — “Dirty Harry,” in 1971, “Death Wish” in 1974, and “Taxi Driver” in 1976. Cult-movies and science-fiction movies were also built around city-wrecking levels of crime, such as “The Warriors” in 1979 and “Escape From New York” in 1981. President Ronald Reagan was elected in 1980, partly because his promise to help stop crime. Once Congress acted to revive tough policing and sentencing, criminals were removed from society and placed in jails. Then the crime rates gradually dropped in the 1990s, and have continued dropping until Obama began his campaign to federalize the nation’s many state and local police forces.